Everyday, 1.8 billion children go to school. While some of them use the sidewalks, other have to cross wide avenues – some even have to cross highways. And every day 500 of these children don’t make it to their classes, victims of traffic fatalities. This reality must be changed. 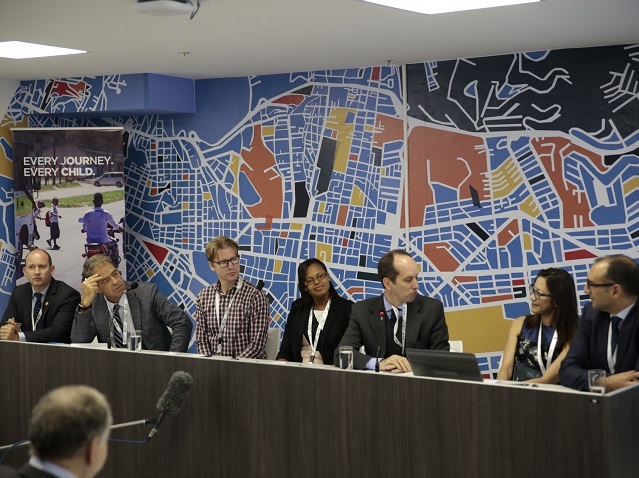 At Habitat III, in Quito, FIA Foundation promoted a panel with experts from different parts of the world that work to transform cities into safer places for people, especially the young. 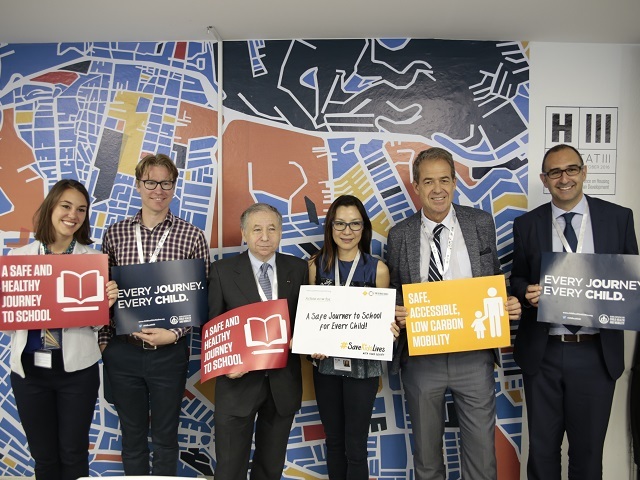 Road safety is one of WRI Brasil Sustainable Cities‘ practice areas, with publications about how to improve safety in bus corridors, how to improve the infrastructure for the bike use in favelas and how to create cities safer by design. “We need to assure that any road intervention in urban areas prioritize the people, and road safety must be the priority in every city and project. This field has a great knowledge to be shared. And it’s unacceptable that streets are still made for cars, especially in poor areas,” said Luis Antonio Lindau, Director of WRI Brasil Sustainable Cities. Saul Billingsley, Executive Director of FIA Foundation; Michelle Yeoh, Goodwill Ambassador of UN Development Programme; Justin Mortensen, from Save the Children Organization; Carlos Cuenca, from Ministry of Foreign Affairs of Brazil and one of the country lead negotiators in Habitat III; Kai Poswayo, an engineer that works with road safety solutions in Africa; and Amend Avi Silverman, Global Director of the UNICEF road safety for children program, were also part of the panel. Michelle and Mortensen have experience in Asia, in countries such as Thailand, Vietnam and Cambodia, where there is a significant share of motorcycles in family’s daily lives. However, helmet use in the region is not widespread. Michelle said that the law helped reduce the rates of people without protection – which was, in some areas, 80 percent of the motorcyclists. “In Cambodia, the schools’ designated pick-up areas are crowded with dozens of motorbikes and children running around them. We realized that many parents started to use helmets after the surveillance increased, but children were still unprotected because the law doesn’t require them to [wear helmets],” explained the expert. In Thailand, where the organization Save The Children works, over 1.3 million children travel by motorcycle everyday, but only 7 percent wear a helmet – even when it is required by law. The traffic kills more than seven children each day, a reality that the Justin Mortensen Organization tries to fight with campaigns that involve children. In order to encourage helmets to be a part of school uniforms, the organization had children paint their own helmets. Child helmet-use is extremely important, since most parents use motorcycles to drop-off and pick-up their children at school. Diplomat Carlos Cuenca talked about Brazilian ambitions to reduce traffic deaths from the Decade Action for Road Safety (2011-2020). He also made comments about the inclusion of road safety in the New Urban Agenda. “It is a good paragraph and we are happy about what was included. It is substantial, and it is something that has never been expressed in a UN document. In my opinion, road safety must be present in every UN resolution,” defended Cuenca.